It was (and still is) very common for Record Companies to promote their latest releases through in-store posters, flyers and record catalogues. 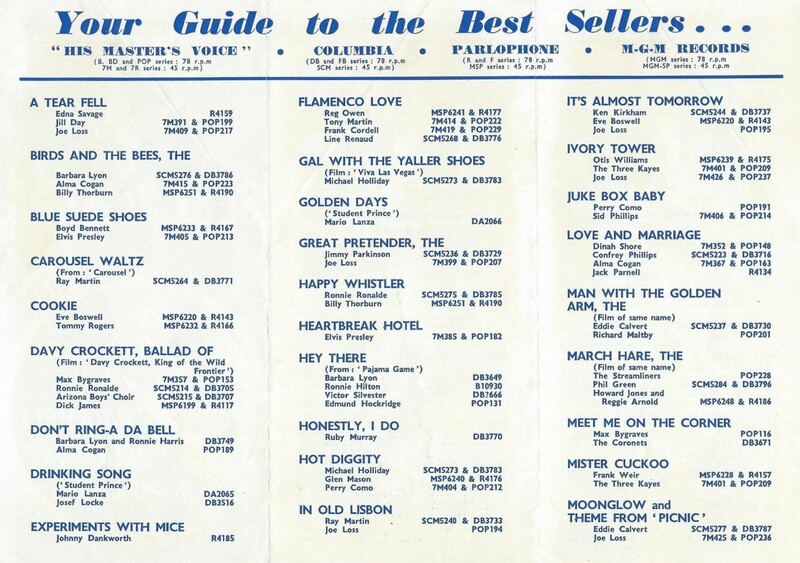 Most of the major companies in the 1950’s published regular (monthly) editions of their catalogue and these would then be sent to Record Stores and/or be made available to the record buying public. These publications were often only printed in small quantities and they would usually be thrown away as soon as the latest (and more up to date) catalogue had presented itself. 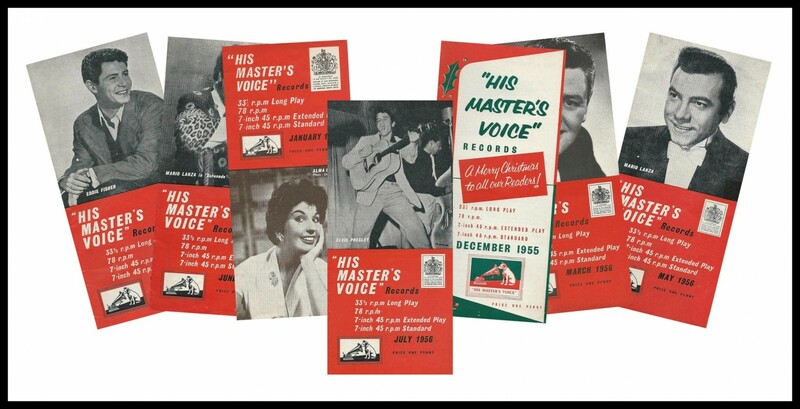 In this article we take a chronological look at how Elvis’ records (78 and 45 RPM singles, EP’s, LP’s) on the HIS MASTER’S VOICE label in the UK were presented in their flyers and catalogues between March ’56 – January ’58. The first time Elvis’ name appears in the HMV catalogue, is in March 1956 when Heartbreak Hotel / I Was The One became his debut single on the UK label. 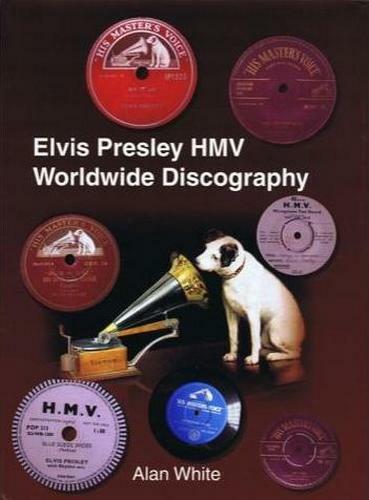 Elvis is formally introduced in the THIS MONTH’S NEW HIS MASTER’S VOICE RECORDS section as: “Presenting on H.M.V. ELVIS PRESLEY”. Heartbreak Hotel was also Elvis’ first single for RCA in the USA. It reached the number 1 position on Billboard and number 2 in the UK. Elvis Presley had arrived (with a bang!) on two major record labels, on both sides of the ocean! 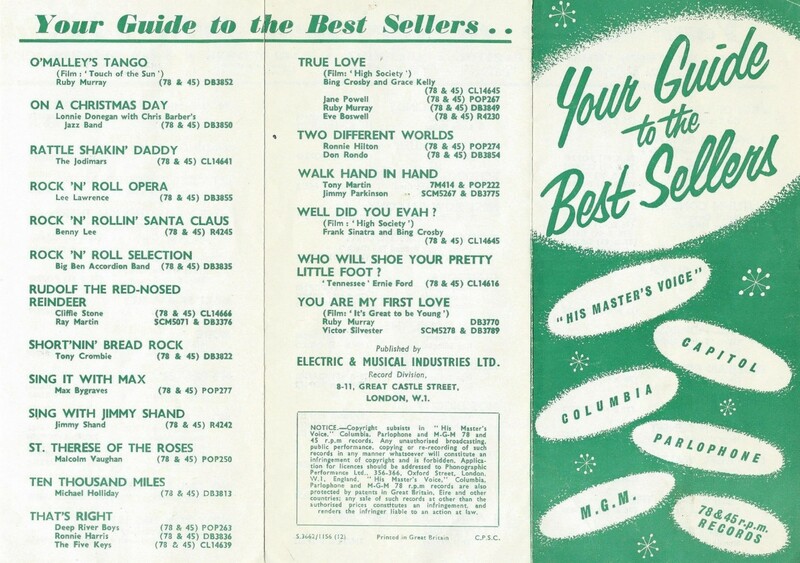 In the June 1956 catalog we encounter Elvis’ second single on HMV, Blue Suede Shoes / Tutti Frutti. This record was actually released to the public the previous month. The release of this Elvis single gets a more prominent mention when compared to the first time he appeared in the HMV catalog: Elvis shares the bottom half of a text-box with major recording star Perry Como. Blue Suede Shoes reached the number 20 position on Billboard, while it climbed up to the number 9 spot in the UK. 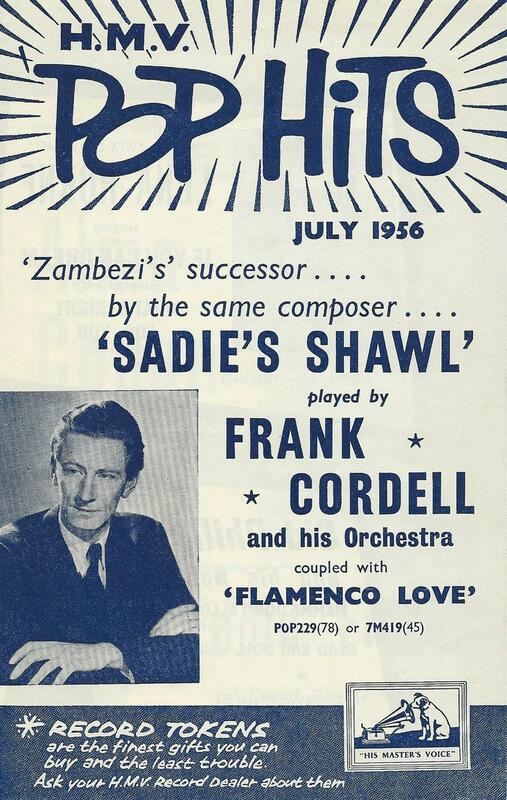 Here we have a rare pamphlet from June, 1956. 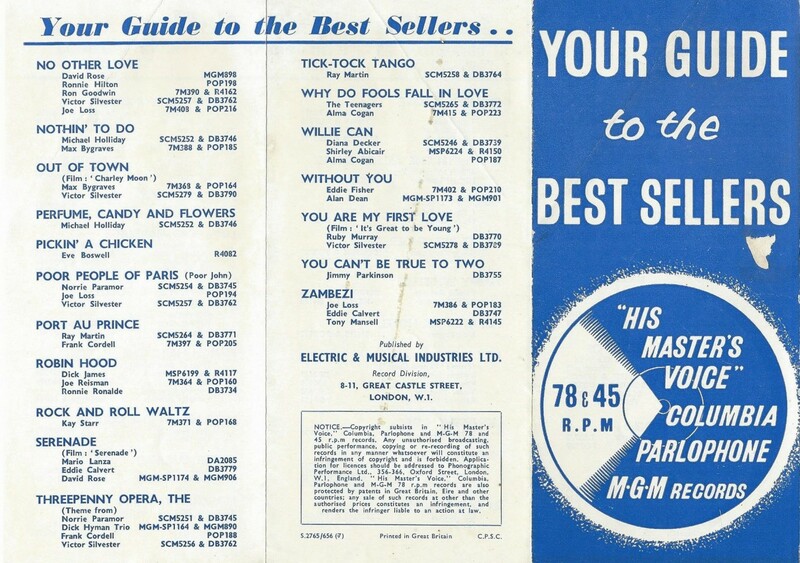 Four major record companies in the UK (HMV, Columbia, Parlophone and MGM) had joined forces to publish a monthly “YOUR GUIDE to the BEST SELLERS” to encourage record shops to stack their products. Only four months after his debut single, Elvis graced the cover of the HMV catalog. Next to that he had not one, but two text-boxes all to himself and both were displayed on top of their respective pages. Plenty of proof that it had taken Elvis only two records to become a major player among the big guns in the British record industry. On the page below to the left, we have an A to Z listing of new songs released in July. I Want You, I Need You, I Love / My Baby Left Me was Elvis’ third single on HMV. On the following page we are given a bit more information about Elvis’ latest single as part of the THIS MONTH’S NEW HIS MASTER’S VOICE RECORDS section. Note that Elvis is hailed as “AMERICA’S WONDER BOY OF SONG”. 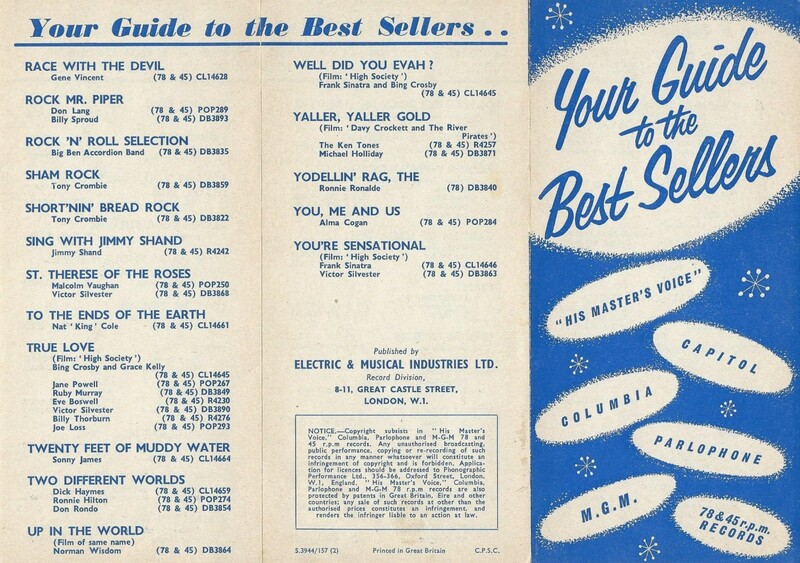 And on the page below to the right we have the BEST SELLERS ALREADY ISSUED ON HIS MASTER’S VOICE section. Elvis once again has a text-box to himself on top of the page, and both of his earlier records are presented here. Also the “WONDER BOY” message gets another mention. I Want You, I Need You, I Love reached the number 14 position in the UK while it went to number 1 in the USA. HMV had coupled some of their latest releases and promoted them as “Pop Hits” through this three panel flyer. The “Wonderboy Of Song” takes the top spot on the middle page with his most recent single. This H.M.V. 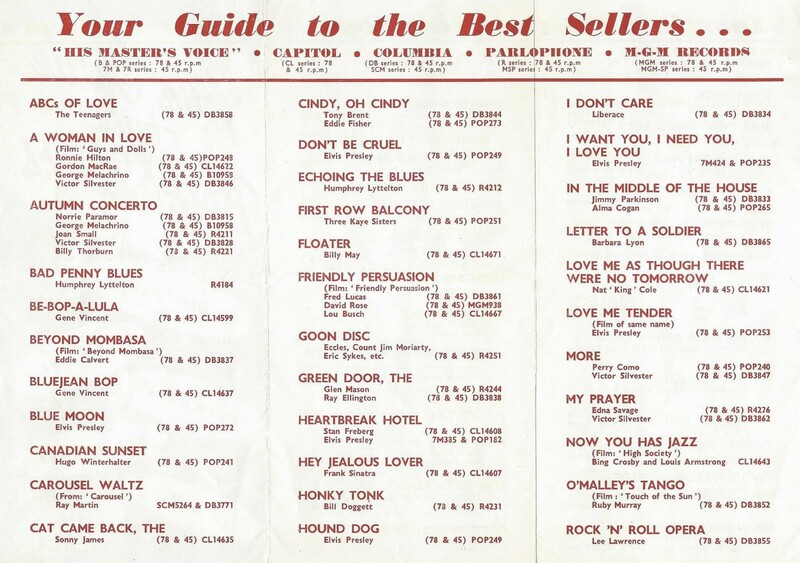 Pop Hits (July 1956) pamphlet measures 20.3 by 12.8 cm closed (as seen to the left), and 20.3 by 38.4 cm when fully opened (below). In the NEW NOVEMBER ISSUES department of this catalogue we see the release of Elvis’ first British LP: Rock ‘N Roll (actually released in October). The cover-artwork of Elvis’ debut album on HMV was identical to his first LP in the USA (‘Elvis Presley’, released in March 1956), but 5 out of the 12 tracks on the album were replaced with different songs. Around the time Elvis’ first UK album was released (7 months after the US version), his second album (‘Elvis’, released in October 1956) went on sale in the USA. The British fans had to wait another 5 more months before HMV would treat them to the LP that would eventually be re-titled Rock ‘N Roll No. 2 and sport an alternative cover (and one of the coolest ever!). Blue Moon / I Don’t Care If The Sun Don’t Shine. Both Elvis Presley (in the USA) and Rock ‘N Roll (in the UK) went to number 1. Blue Moon did not chart in the USA, but it reached the number 9 position in the UK. Columbia, Parlophone and MGM are now joined by Capitol. Love Me Tender / Anyway You Want Me was Elvis’ sixth single (in just ten months) on the HMV label. Another premiere this month: the back-cover is dedicated to HMV’s complete Presley catalog (six singles and one LP). Love Me Tender went to number 11 in the UK and it reached the number 1 spot in the USA. presented in this article, these were not just strictly different versions released by different record companies either. January 1957 saw the release of Elvis’ first EP (of two) on HMV: Love Me Tender. The EP gets a short mention in THIS MONTH’S NEW RECORDS listing, before we are given more information (including the tracklisting) two pages later in the NEW JANUARY ISSUES section. The next page once again shows us a complete list of Elvis’ HMV releases under PREVIOUSLY ISSUED RECORDS. For the second month in a row, Elvis has the back-cover all to himself with HMV’s spotlight on the Love Me Tender EP. 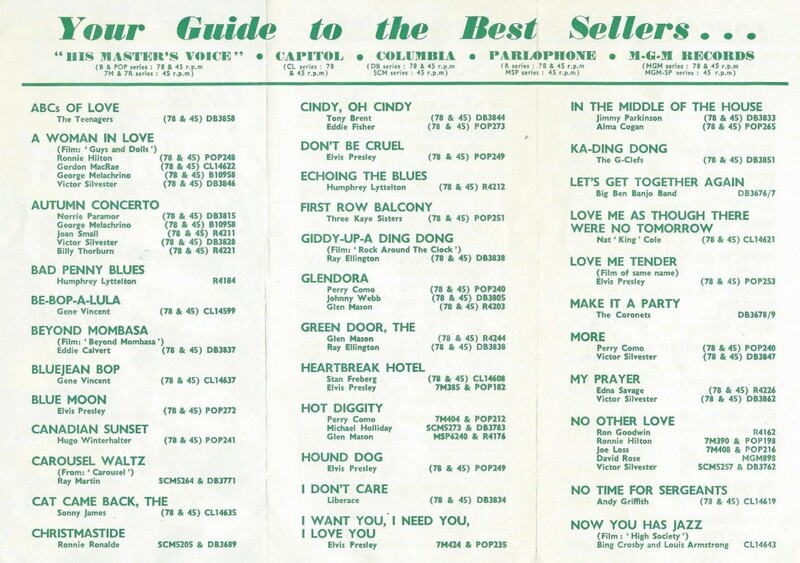 Chart listings for Love Me Tender (EP) can not be given since Billboard did not start an official EP chart until October 1957, while in the UK the first EP chart emerged as late as 1960. There was no new Elvis release this month, but we find a complete list of Elvis’ HMV records in the PREVIOUSLY ISSUED RECORDS section. With 8 very succesful releases in just 11 months (6 singles, 1 EP, 1 LP), Elvis’ first year at HMV had been quite an achievement. The “HIS MASTER’S VOICE” Records catalogues measure 10 by 21.3 cm. The YOUR GUIDE to the BEST SELLERS are 19 by 9 cm closed, and 19 by 26.6 when fully opened. 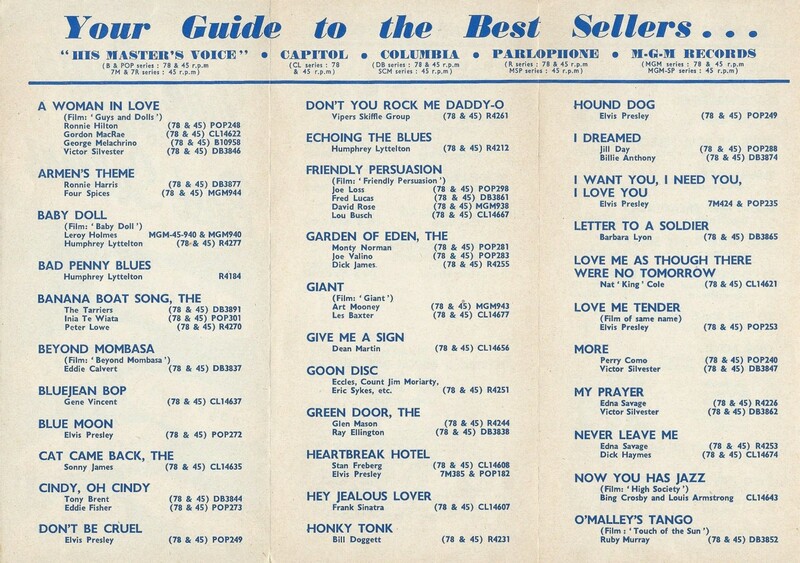 As of March 1957, the format of the HMV Records catalogues changed. The total amount of pages went from 24 to 16, while it’s size went from narrow (10 x 21.3 cm) to wide (12.8 x 20.2 cm). 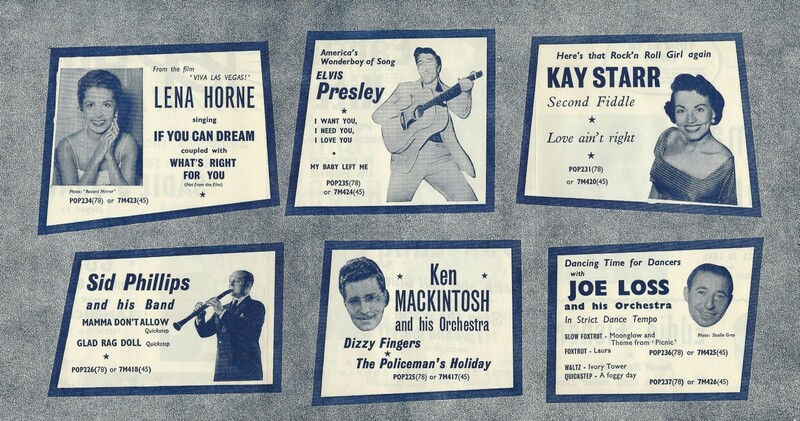 All of these, plus plenty more rare Elvis-related HMV flyers, coming up in PART THREE. 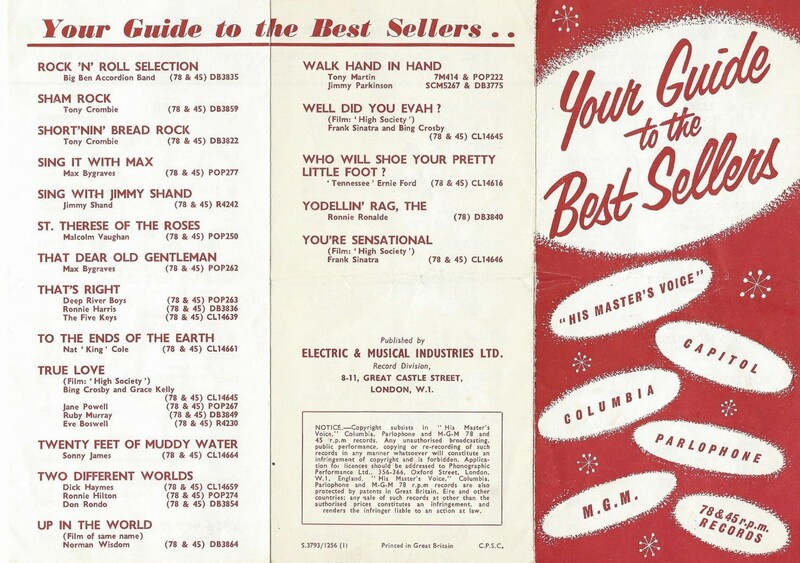 All catalogues and flyers that are presented in this article are from ALAN WHITE‘s private collection. My sincere thanks and appreciation to Alan for scanning and sharing these rare pieces of vintage paperwork with the visitors of Echoes! Alan is the author of ELVIS PRESLEY HMV WORLDWIDE DISCOGRAPHY. Thanks a lot for taking the time to scan this stuff for Echoes. It’s such a visual treat ! Excellent to see these finally get a good viewing, many thanks Alan for sharing these, wonderful stuff.. Wonderful ! Thanks for putting it altogether. Thanks guys it really makes it all worthwhile when other fans appreciate my collection, and thanks to Bob for displaying it professionally . Very interesting read, thanks for sharing. 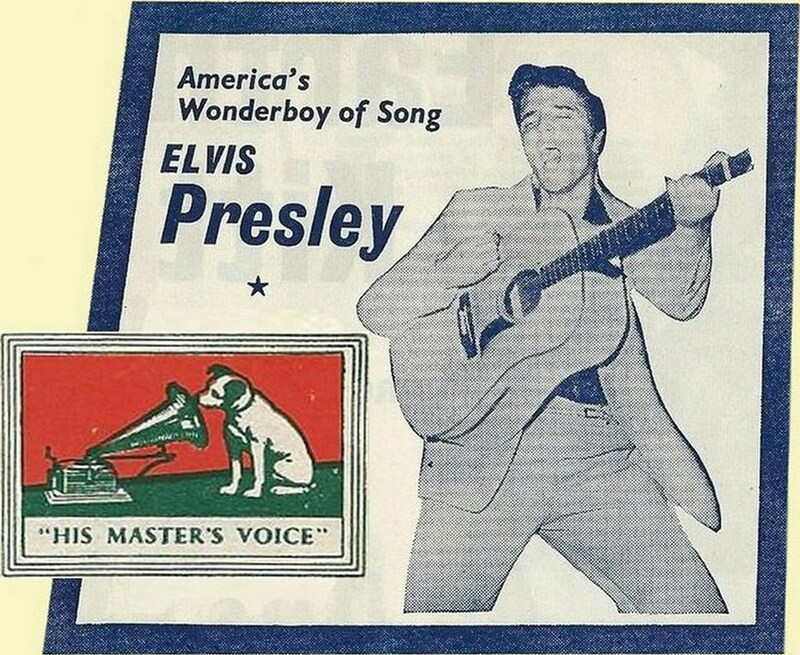 “America’s Wonder Boy of Song” – that made me smile. I still need a couple of Penny Pamphlets, if anyone has any for sale (Elvis era), please let me know, Alan. Why were the early records of Elvis issued on HMV in the UK and not on London American like the other Sun artists material was ? Was it to do with the timing of the sale of Elvis’ contract to RCA ? Or is there another reason? Bob has added January and February 1957 and updated the page, great work Bob. Great article, enjoy reading it. Very well presented here.